Glenn Murcutt will discuss the process of designing the Australian Islamic Centre in Newport, Victoria with architects Billie Tsien and Tod Williams. Murcutt built his career as a sole practitioner over the past 46 years designing smaller scale residences in close collaboration with each of his clients. In the biography printed on the occasion of winning the 2002 Pritzker Prize he declared, “Doing many smaller works provides me with many more opportunities for experimentation.” Murcutt’s residences blend modernist sensibility with regional craftsmanship and a sensitivity to the natural environment. His philosophy aligns with the Aboriginal saying “touch this earth lightly,” a phrase that formed the title of a 1999 biography on the architect by author Philip Drew. 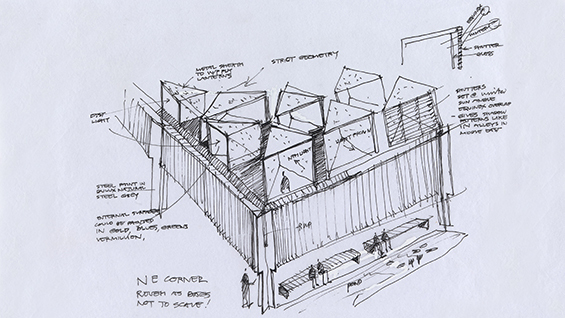 In 2004, the Newport Islamic Society awarded the design of its Australian Islamic Center to Glenn Murcutt in collaboration with architect Hakan Elevli of Melbourne-based practice Elevli Plus. Located in a Melbourne suburb, the building was commissioned when the group began to outgrow its previous temporary mosque located in an informal commercial building. The architects consulted with local Islamic architects, imams, and community leaders to gather input on how a new religious center could welcome visitors of all faiths. Their resulting design integrates what is considered to be one of the largest mosques in the country with a community center, library, restaurant, the imam’s residence, basketball courts, a women’s area, and administrative offices in a complex intended to serve multiple publics. Murcutt is the 2002 Pritzker Prize Laureate and has received 25 Australian Architecture awards including the RAIA Gold Medal. He is also the recipient of the Order of Australia, the nation’s highest civilian honor. In 1992, Murcutt was awarded the Alvar Aalto Medal and in 2009 he received the American Institute of Architects Gold Medal. He is also the recipient of the Richard Neutra Award, the Thomas Jefferson Foundation Medal in Architecture, the Green Pin International Award for Architecture and Ecology, and the Asia Pacific Culture and Architecture Design Award, among others. Murcutt has been a visiting professor of architecture at numerous prestigious universities around the world, and continues as a professor at the University of New South Wales Australia. He currently serves as a chair for the Pritzker Prize. Billie Tsien and Tod Williams are principals of Tod Williams Billie Tsien Architects | Partners. Tsien currently serves as President of the board of directors of The Architectural League of New York.